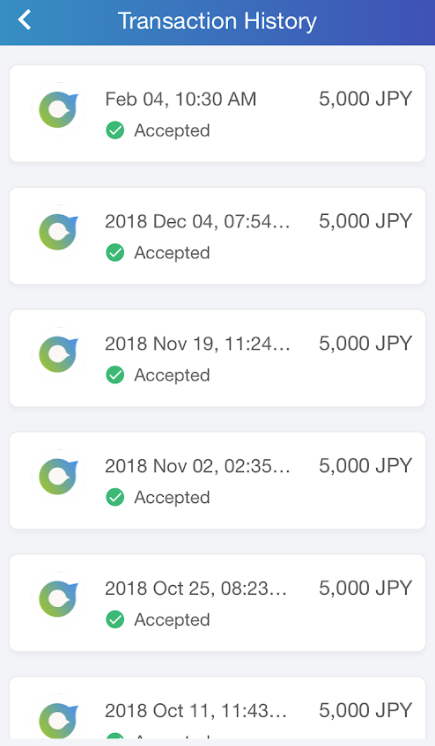 How do I sign-up to use Oyraa? You can book remote conference-calls with an interpreter by downloading our mobile app via the App Store or Google Play. To book an on-site interpreter, just sign up via our web platform at oyraa.com and start browsing. 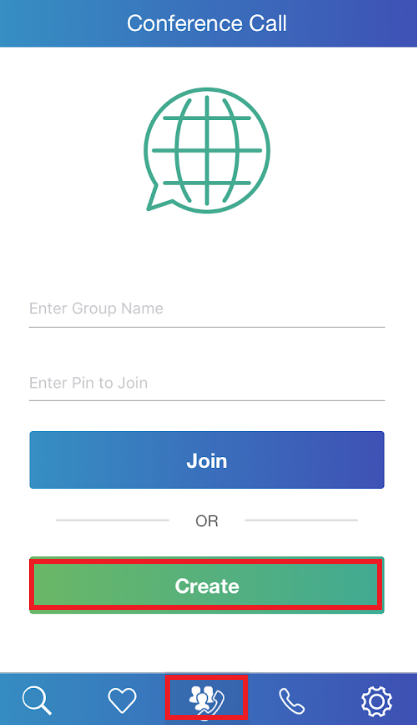 If you’ve already subscribed in one platform, just use your credentials to login in the other. Why should my company be using Oyraa? Oyraa is an online platform of professional interpreters. We bring you highly skilled interpreters without the enormous agency fees. You can handpick them yourself, by industry, expertise, languages spoken, ratings and even location. Our interpreters are only a call away and are available instantly. How do I pay interpreters? You can top up your account with online credits and use it to request a remote interpretation. For on-site assignments, you can pay online with your credit card or using Paypal. Your payment is safely kept by Oyraa until your interpreter completes their assignment. Once the job is done, we free your payment to your freelancer. When are your interpreters available? 24/7, no breaks, no delays. Because we’re a global network, we cover all languages, all locations and all time-zones. How much time do I need to wait for a quote? You can find out our interpreters’ rates by browsing our available freelancers. Their rates are advertised instantly on their profiles. We don’t believe in waiting for a quote and you can always negotiate with prospective interpreters! 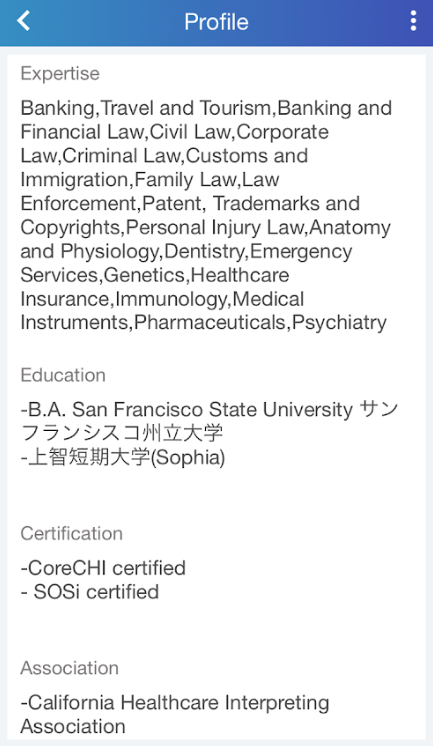 Our platform features professional interpreters from all backgrounds and industry expertise. It is very likely that you’ll find what you’re looking for! Otherwise, just shoot us an email at customer.support@oyraa.com and we might just have the person for the job. We may request that you provide us with additional information to help our interpreters familiarize themselves with your industry. Each interpreter signs a confidentiality agreement and is bound by a strict Code of Ethics, ensuring that all the information pertaining to the work they do for you remains strictly confidential. Additionally, and if it’s an on-site job, we advise our clients to sign an NDA with the interpreter. Can I use my interpreter longer than the amount of time I scheduled? You can! For remote interpretations made over the phone, you can talk as long as you want, and as long as you have enough credits. 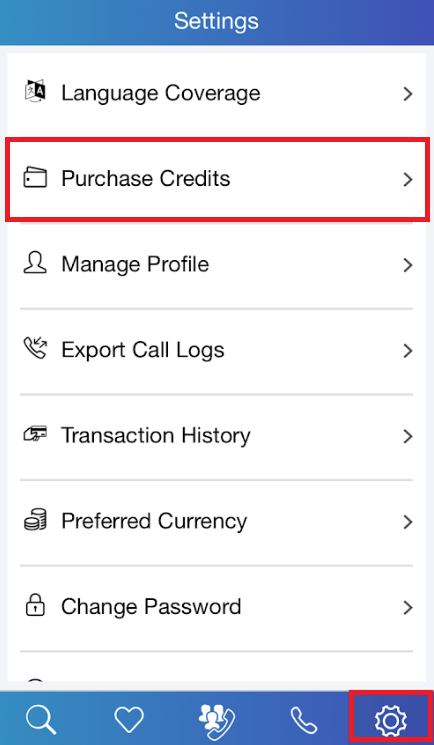 If you’re running out of credits during your call, you’ll get a notification and you can top up your account. For on-site interpretations or scheduled calls, Oyraa will mediate any extensions. Can I get an on-site interpreter? Yes, absolutely! Our website (www.oyraa.com) allows you to request an on-site interpreter. 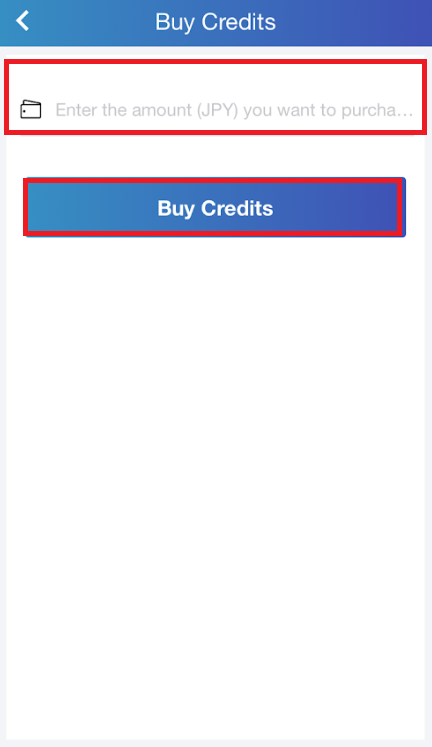 We don’t charge any commission on the assignments you order via our app. Not a dime. I have a technical issue, can you help? Just shoot us an email to customer.support@oyraa.com or visit our Help page. We’ll get back to you within 12 hours. 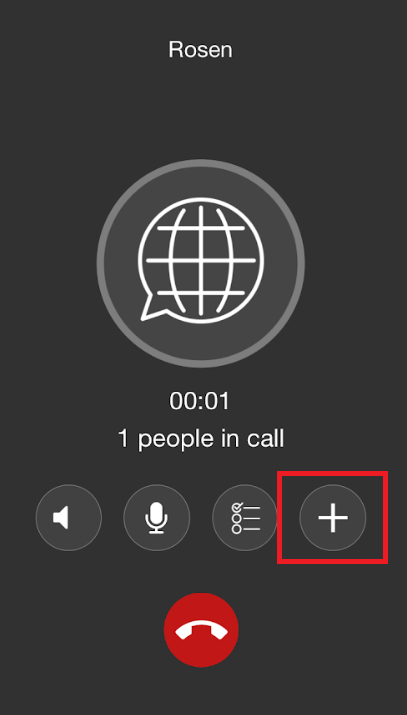 How can I use audio/video call on the app? 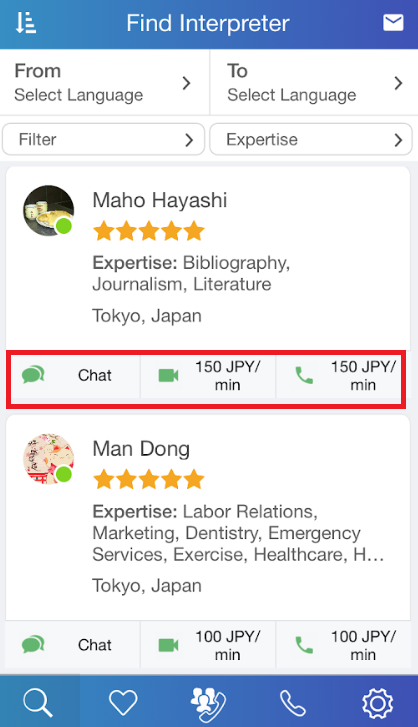 To make an audio call with the interpreter, please click on "Telephone icon" and for a video call click on "Video icon" in interpreter's profile, Also in the chat there is a similar icon so you can also start a call by clicking on the icon from there. (There are cases the interpreter turns off the camera function. 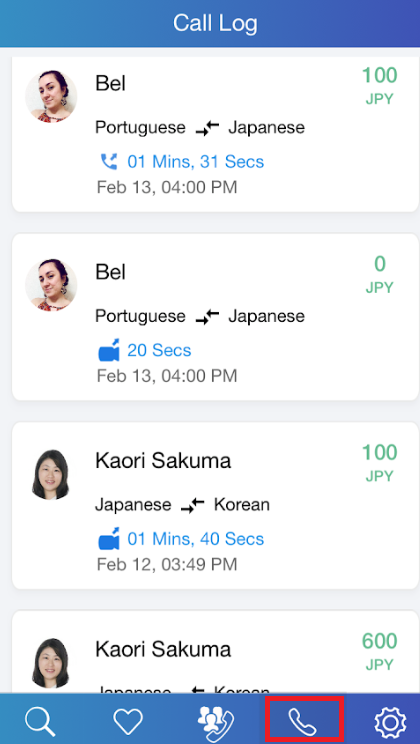 In that case as well, the interpreter can check the image of the user by video call, so use the camera to present the document etc to show the interpreter for translation if necessary. 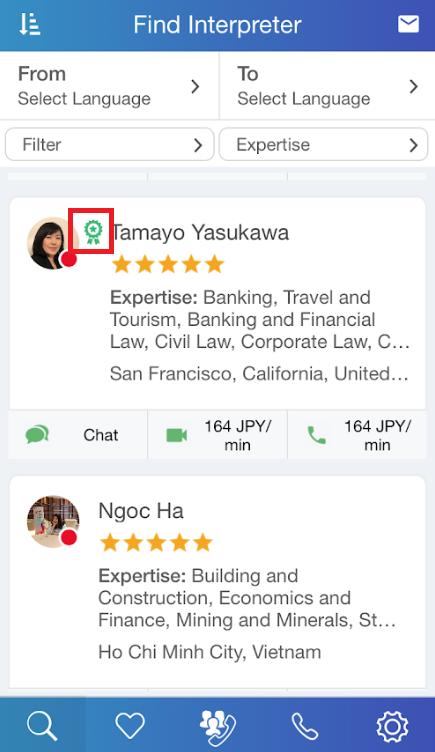 You can search interpreters from [Find Interpreter] by clicking on the magnifying glass shape icon at the bottom left of the app screen. 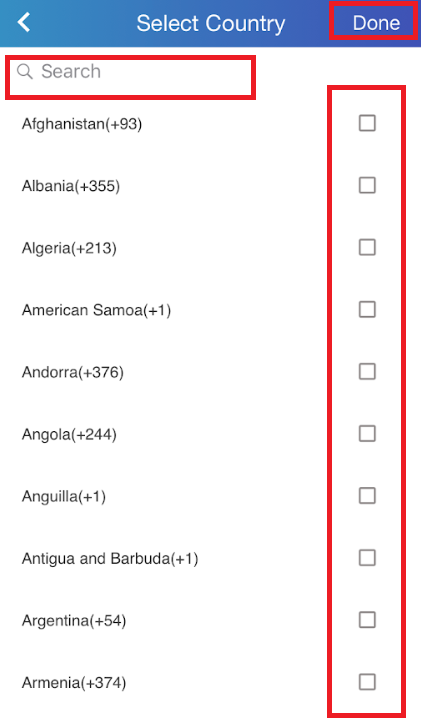 Please select a language at each in "From" and "To" field. 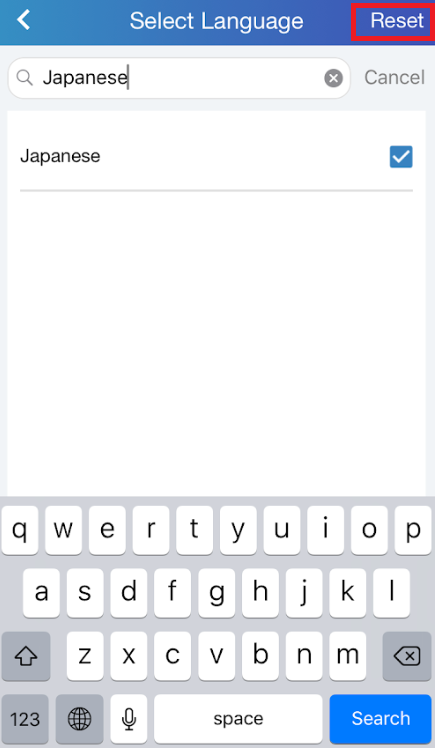 To select a new language again, press "Reset" in the upper right and select another language again. The relevant interpreters will be narrowed down. 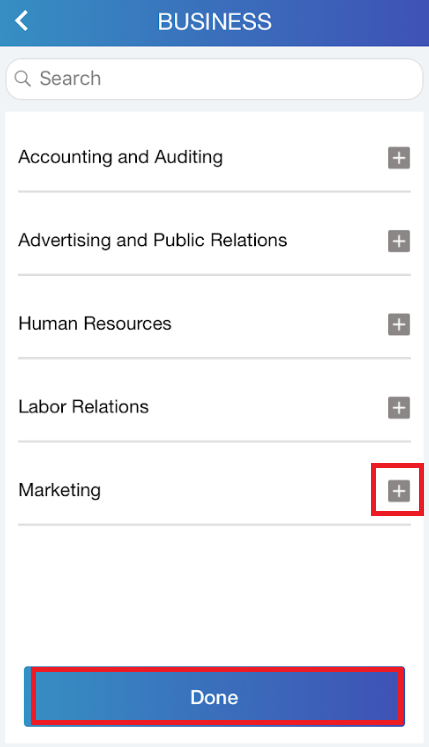 Also, specify the necessary conditions from "Filter" and click on "Submit" button to narrow down further. You can specify the "Expertise" of interpreters also. In the interpreter's profile, please refer to their profile details and badges for professional interpreters those who are qualified by Oyraa. 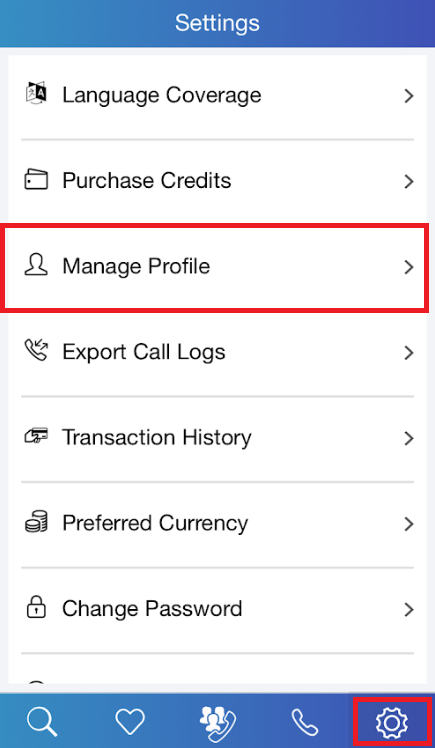 You can check from [Call Log] by clicking on the telephone shape icon at the bottom of the app screen. 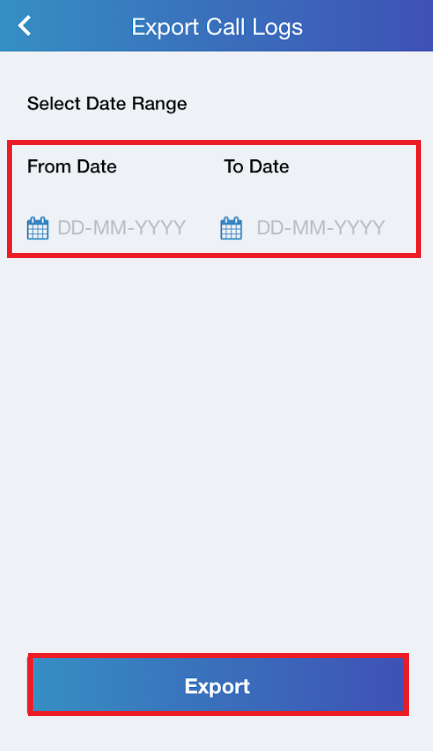 In [Call log], interpretation fee for each call is also indicated. 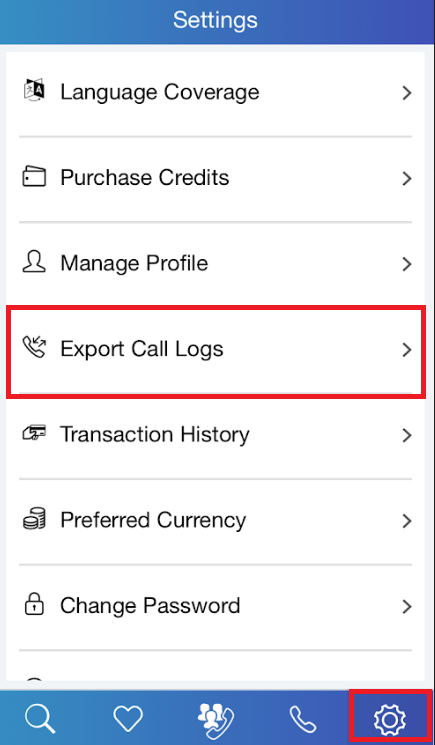 If you want to export call logs, click on the gear shape icon at the bottom right of the application screen, go to [Settings] → [Export Call Logs] , select date range and click "Export" . So a call logs statement will be sent to your registered e-mail address. 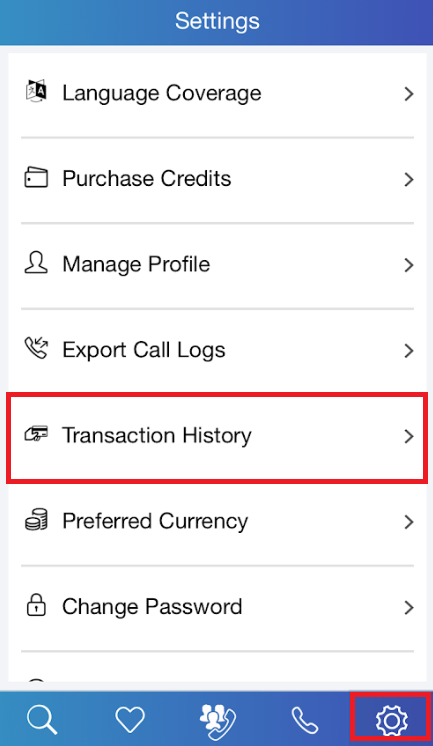 You can check the transaction history of purched credits from [Settings], the gear shape icon af the bottom right of the app screen→ [Transaction History] . Can I create a conference call with an interpreter and call a landline number? 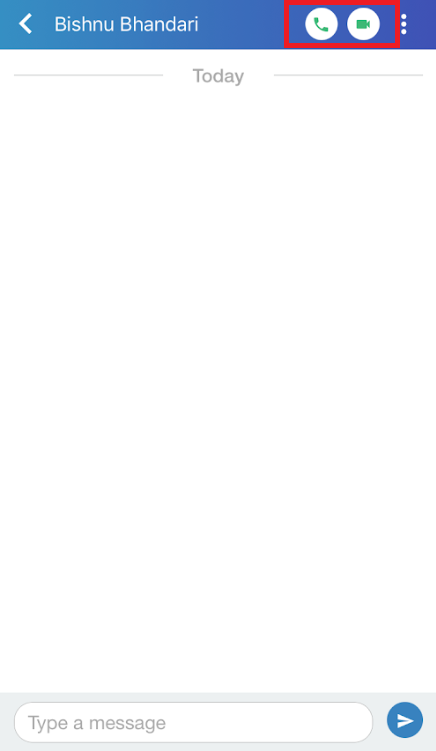 In order to do that you need to access the "Conference" tab as shown in the photo below. Once you are the "Conference" page, click on "Create". 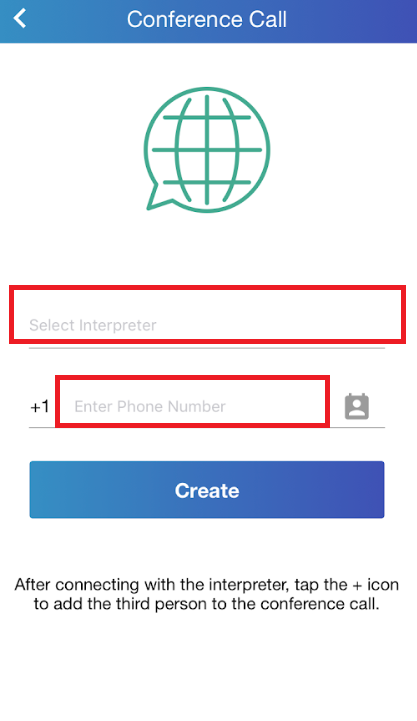 You can now select the interpreter you would like to hire for your call and input the telephone number you are trying to reach. Make sure you select the right country code for the call. 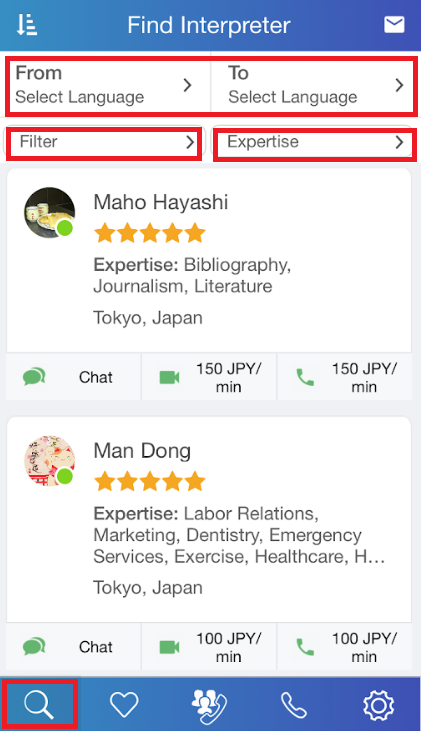 If you would like to get the contact directly from your contact list, please click on the little icon on the right side. 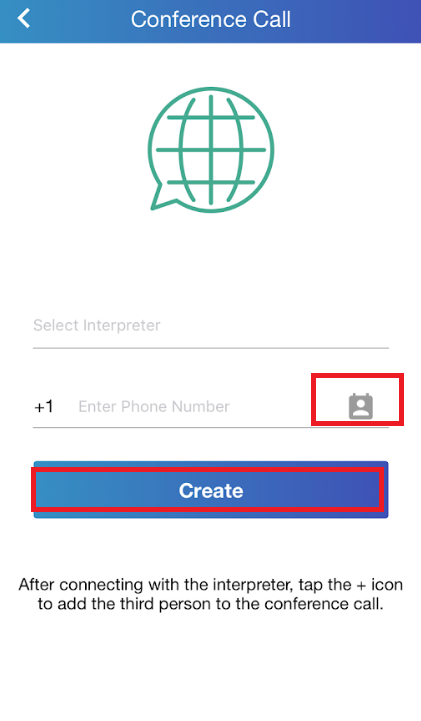 Once you have selected an interpreter and entered the telephone number of the third participant, press on "Create". 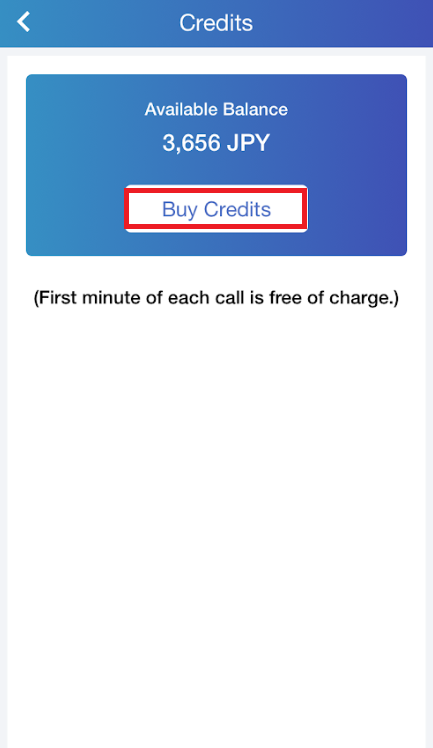 Please make sure that you have enough credits on your account as there is for conference calls the first minute is not free of charge. 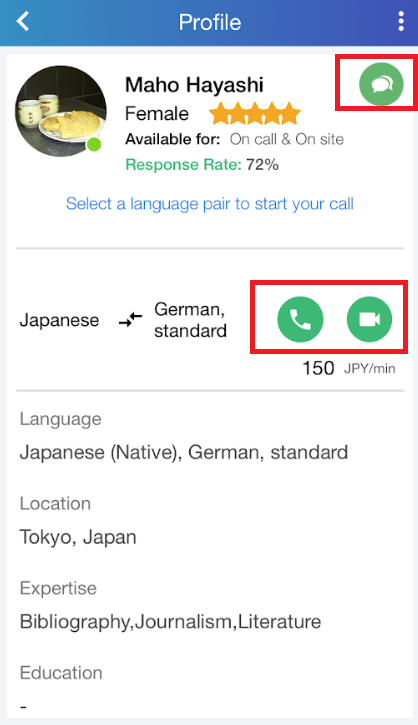 You will first be connected with the interpreter and once both of you are ready, you can click on the + icon of your call UI as shown in the photo below. The call will now be connected with the third participant.